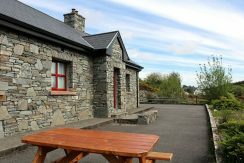 CLIFDEN: Centrally located with a Variety of Restaurants, Pubs and Shops, Traditional Music and Craic, Sailing, Trout, Salmon and Sea Fishing, Hill Walking. 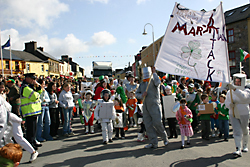 Highlights are The Connemara Pony Show and the Clifden Arts Festival, there is also a great St Patricks Day Parade, and the Connemara Pony Sales are a great day out. 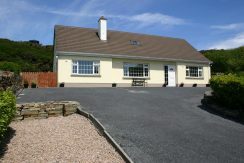 Clifden is really the capital of Connemara and nestles between the twelve bens mountain range and the Atlantic Ocean at the top of Clifden Bay.It is 60 miles from Galway on the N59 road and a capital town of Wild Atlantic Way. There are numerous hotels, restaurants pubs and shops. 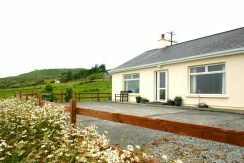 Whatever your taste in holiday, be it walking, sailing, diving, cycling, bird watching, fishing in sea, lake and river, or simply relaxing in front of a cosy open fire, Clifden is an ideal spot to base a holiday. Families will enjoy visiting the many sandy beaches in the area and swimming in the crystal clear sea. For the fisherman the Owenglen River and numerous lakes in the Clifden area hold salmon and sea trout. All licenses and permits needed can be bought locally. Most of the brown trout fishing in lakes is available free or at a nominal charge. 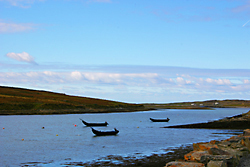 A number of sea angling charter boats work from Clifden harbour. They provide some of the best and most reliable sea angling in Europe. For the late season holiday Clifden has its own arts week at the end of September. The festival week is always very entertaining with musicians artists poets and craic. Details are here http://clifdenartsfestival.ie/.Come to Clifden and find out for yourselves. The founder of the town, and owner of the land the the town was built on, built his home Clifden Castle a mile outside the town on the Sky road, and then proceeded to establish Clifden as a Market Town. The two major streets, Main and Market, meet at the square and seem to be built around the original streets of Market Hill, if you take a detour in your exploration of the town and take a left in the middle of Main Street you can walk up Market Hill and see some of the remains of the original shops and houses. 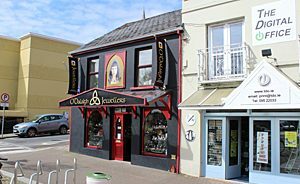 One of the most attractive features of Clifden is its colourful shop fronts, when the town was being built one of the requirements D’Arcy placed on his tennants was that the shops must be whitewashed every spring. In keeping with the original intent the citizens of Clifden have gone a step further and the bright pinks, yellows and greens look very attractive in the morning sunlight. The twin spires of Clifdens Catholic and Protestant Churches dominate the landscape. From any viewpoint they seem to dominate the town and they are an integral part of the history of Clifden. It is a little known fact that, long before Dublin was lighting its streets with electricity, Clifden was generating its own power with a power station located just above the waterfall at the Ballyconneely Road supplying the town and houses with 220 volt electricity. Millars Mill, a major employer for many years operated just above the powerhouse at the base of the old gaol. The power station supplied electricity to the mill for the looms which made tweed. The mill closed some time ago, but Millars Tweeds still have a very interesting shop on Main street. 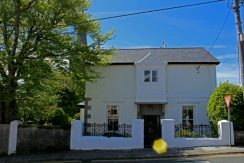 Clifden Community Arts Council was founded in 1980 and since that time it has orgaised Arts Week held annually the last week of September. This festival was first intended to bring experiences of all the Arts to the students attending the community school. Since its beggining as a two day event it has grown to fill a full ten days with music, poetry drama and the visual arts. Just a short drive from the town on the Ballyconneely Road is the memorial built to honour the intrepid pilots form the United States who landed their plane in the bog on the completion of their flight across the Atlantic. The spot is now been made very accessible by the creation of the Derrygimlagh bog walk which also has guidance and interpretive information about the Marconi Wireless Station which was involved in transmitting radio signals across the Atlantic in the early days of radio. This is a great afternoon walk. Other walks around Clifden would include the Sky Road, and a stroll down the Beach Road to the Clifden Boat Club for a coffee or a meal.